I love Instagram. Love it! It’s the most productive of all the iPhone time wasters. I made it to level 74 of Candy Crush about 6 months ago before becoming afflicted with sudden onset virtual diabetes. Games are mesmerizing and nominally relaxing but all the benefit ends the second I stop. Instagram gives back. I enjoy it even when I am not doing it. In fact, now I am never not doing it because I think about what I am going to post next all the time and what I am going to post next is art. In the last year or so I’ve returned to making more two dimensional art on paper and sharing it on Instagram. It’s great because the little grid of posts is like a mini art studio where I can contemplate my themes, interests and techniques. This is a familiar place but one I haven’t been in for nearly a decade. I gave up painting somewhere in my daughter’s preschool years as the intersection of parenting and documentary video editing ate all my time. I never completely stopped, I kept drawing in little blank books, but I ceased actively reviewing my work in this arena. I lost consciousness of my body of work and it ceased to flourish. Thanks in part to Instagram and in part to my recent overwhelming need to make abstract art, the creative beast is out of hibernation. Drawing woke it up and Instagram offered it art salmon. Or drawing gave me a lot of stuff to post and Instagram rewarded me with ego biscuits. Getting likes is motivational. I love seeing my posts add up. The more I post, the more inspired I became. Since my main art goal in life is to make as much as I can before I die this is a really helpful tool. By keeping me conscious of what I have been doing, the Instagram grid of posts puts me in a never ending dialogue with my work. I follow a lot of artists on Instagram. I pick them because I think they make interesting work. If I see a picture I like, I click the person’s homepage and look at their grid. I am attracted to attractive grids (how’s that for a sentence that couldn’t have been written in any other era). If I like that, I switch to the linear mode and look at each post separately. Beside the art itself, I am attracted to posts that make sense in relationship to each other. Does the artist bring the same eye to their dog photos that they do to their paintings? It’s not that I need or want every post to be brilliant, whatever that might mean, but I want it to be curated. Is that fair? There is nothing inherently “fair” in optional actions, right? It does make me ponder how others judge my grid of art. That’s an issue with Instagram. There is the individual post and the totality as seen in the grid. To me, I want them both to be satisfying. It’s challenging. I’ve wondered if my grid is it too eclectic? I make several different kinds of art. 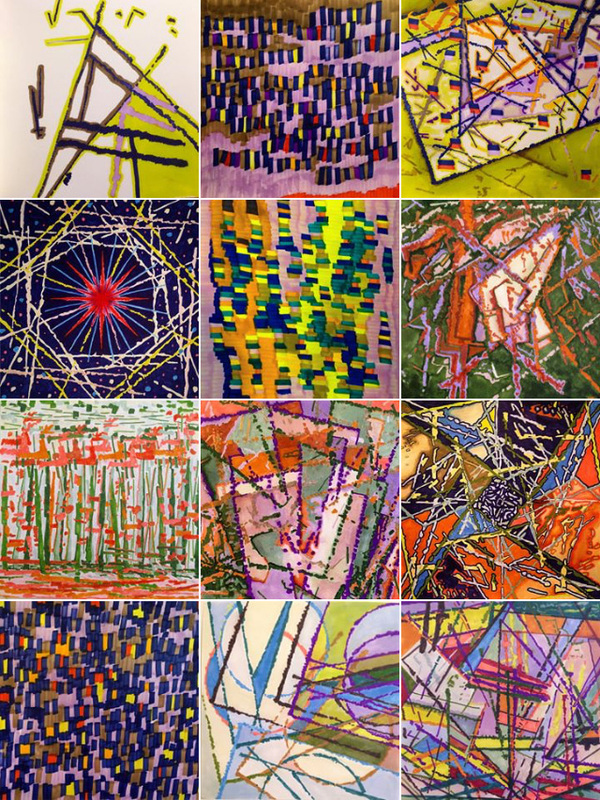 If I only posted my abstract work, my grid would look like this. 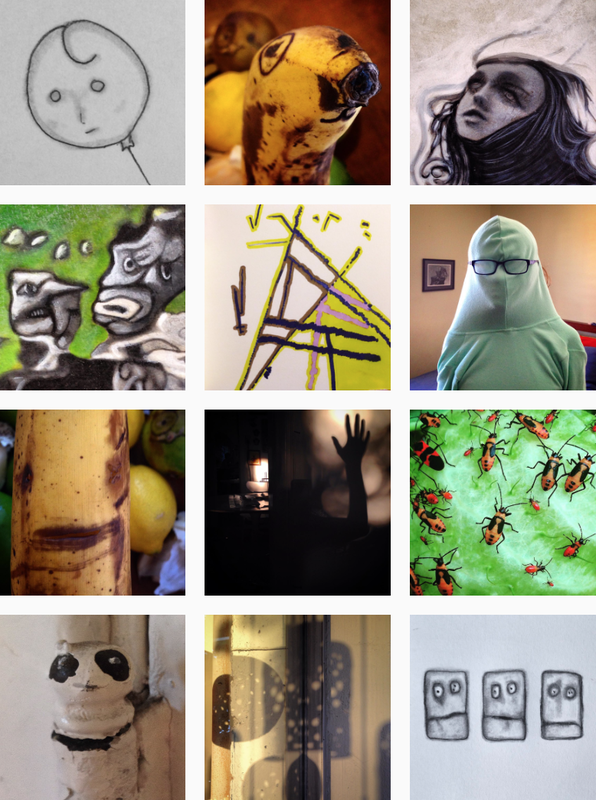 But I also like to post my old surrealist paintings, banana faces, pencil drawings, shadow photographs and other things. So my grid looks like this. You just don’t know what kind of art you are going to produce before you produce it. You may think you know but it’s only in reviewing it after the fact that you can say, oh, so that’s what I make, that’s my style, those are my concerns. To me it’s the most interesting thing to do and gives life great joy and meaning. It’s the opposite of consumerism, an antidote I need to stay sane. Currently my Instagram account is occupying a lot of mental resources. I can spend more time considering whether two of my Instagram images look good next to each other than I can considering where are we going to live when we retire. That’s probably not good but it’s keeping the artwork flowing. And they really do look great together. It makes a larger piece of art, like you say. Luverly! I can relate to your love of ig. 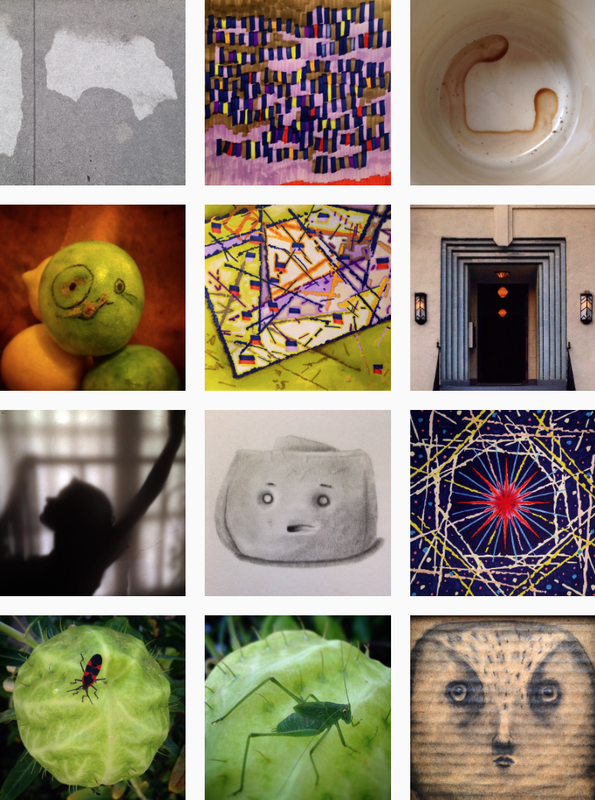 I’ve become quite enamored with it myself and I think about the grid as a whole and how each post affects it. I also appreciate your insight into how it helps you define your directions and styles. I like the eclectic example because it’s got more openness and the variety keeps it from stagnating. The abstracts look cool but they jostle against each other in competition for the eye. Thank you so much for the lovely comment Laird. It is nice to see you over here. I haven’t looked at this post in a while and yes you are right, those abstracts are too kinetic to all be together like that! I have already moved on from that style. Art and what I make is so mysterious to me. Just when I think I am really onto something everything changes. But for me making art is like taking a walk in the woods, no direction, just responding to the beauty. So you said leave it a secret but I will tell you anyhow. I was an old school photographer for many years, with a darkroom. When I started painting, I merged the two and I started making abstracted photographs that I could paint on. I hate breaking the magic but I also don’t want to let you think something that is not true. I am not a superb realist painter, I developed a technique. I do think of them as paintings as I fully paint on them and add all the faces and details. They are all horrible photos before I paint them, intentionally, they are not meant to be photographs, just a launch pad. It’s a multi step process that at that time, did start in a camera. I no longer have a darkroom (does anyone?) and my process has changed. But maybe someday I will get back to this. Hard to know. It’s been nice to share them again. I like the notion of self-curated. I’ve been on instagram only a little while but I started to be aware that I wanted my grid to have balance / not be too excessive. I think it’s basically an extension of considerate conversation. Within that, a common wavelength can be shared. And maybe an artist contains several co-artists, like Riley’s emotions in ‘Inside Out’. If I had only ever seen your abstract grid, I would not be inclined to think of it as only part. It seems like a whole personality within a personality.